Restoring an 18th century pub to former glories. Following a comprehensive refurbishment of Hurley House, a traditional English pub and restaurant in Berkshire, we worked closely with designers Spratley Studio Architects and Summer Williams Interiors to find a hard-wearing stone that would complement the traditional-style décor of wood panelling, exposed chimney breasts, luxurious leather and tweed upholstery. 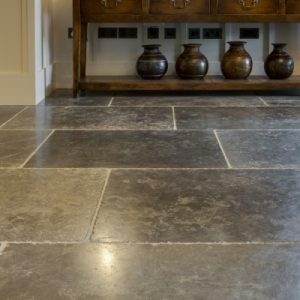 Our Hardwicke limestone is an exceptionally hard flagstone with a dark grey tone that perfectly complemented the rich wood, and acts as a contrast to the white walls. We recommended a seasoned finish that mechanically rounds the edges of each slab and exposes the surface grain for an authentic time-worn look.